DG is not powerful villain material. I think we have indeed lol! 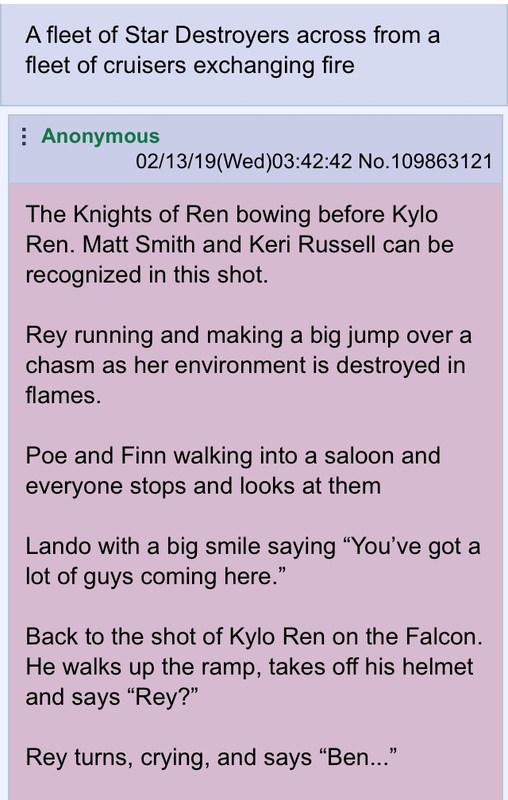 One possibility that would explain the delay is the one I suggested previously; Matt and Adam are roughly the same height and Kylo is supposed to spend much of the beginning in the film behind a mask. So if the big villain plan is to swap Ben/Kylo out with a masked body double they wouldn’t need the man behind that mask immediately since the whole point would be that he sounds and moves as much like Kylo as possible (i.e. Adam would be doing the voice work until the mask comes off). I’m mainly familiar with him from Doctor Who, but Matt Smith is a fairly physical actor who’d be pretty good at conveying mood and emotion while behind a mask and can also really pull off the creepy once the mask does come off. Ok two days later our same “leaker” from two days ago has got another faf leak . This one is entertaining though - kylo sounding like a right tyrant with his knights - Am sure there was something like this with another faf leak for TLJ where someone gave kylo a look he didn’t like and he executed him . This is pure fanboy fantasy .Well this is the same kind of thing . Also @Man Without A Star I think this faf leaker is our new Mike Zeroh ! Lol! Read the comments too because they are funny too. I haven’t taken a screen shot this time round because there is some cursing /swearing in the leak . @AhsokaTano wrote: Ok two days later our same “leaker” from two days ago has got another faf leak . This one is entertaining though - kylo sounding like a right tyrant with his knights - Am sure there was something like this with another faf leak for TLJ where someone gave kylo a look he didn’t like and he executed him . This is pure fanboy fantasy .Well this is the same kind of thing . Also @Man Without A Star I think this faf leaker is our new Mike Zeroh ! Lol! Read the comments too because they are funny too. He made it after the guy leaked about costumes that sounded like KOR-type designs. I mean I don't doubt he was right about a few things, but now he seems to spread leaks based on already supplied info from reliable sources, likely hoping it makes his leaks sound legit. He did it with Matt Smith too if I remember correctly. The only leaks I actually follow are pics from the sets, but I am amused and curious to see what leak he invents next based on legit facts. @Man Without A Star @AhsokaTano - new He Who Shant Be Named? Haaa love it. Maybe this leaker is him under a new identity so he can actually have content for his vids! @DeeBee wrote: @Man Without A Star @AhsokaTano - new He Who Shant Be Named? Haaa love it. You know, I wouldn't be shocked if that actually happened. Yeah he’s back - he/she is our new He Who Shant Be Named - see discussion above . 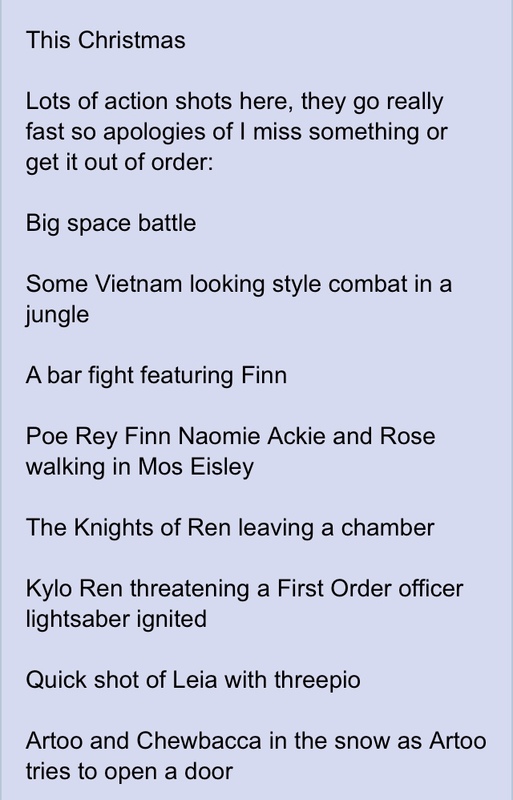 That knight of Ren leak is funny . Reminds me of TLJ faf leaks where Kylo killed those who stared at his scar ! Lol! That second leak you found cropped up before the faf knights of Ren leak. I think that second leak is credible. But not just Lando because there’s faf in there about how Vera ( lando’s daughter )knew Ben solo . Am rolling my eyes at this stuff now and people are telling this leaker troll to stop in the comments . At this point this leaker is either JJ Abrams himself - No way can someone know as much as he/she claims to know unless they are JJ or they are being paid to spread this barrage of fake leaks because maybe something did get leaked ie knights of Ren ( Lucasfilm employees at museum checking out medieval weapons ) which sounds like it could be true. 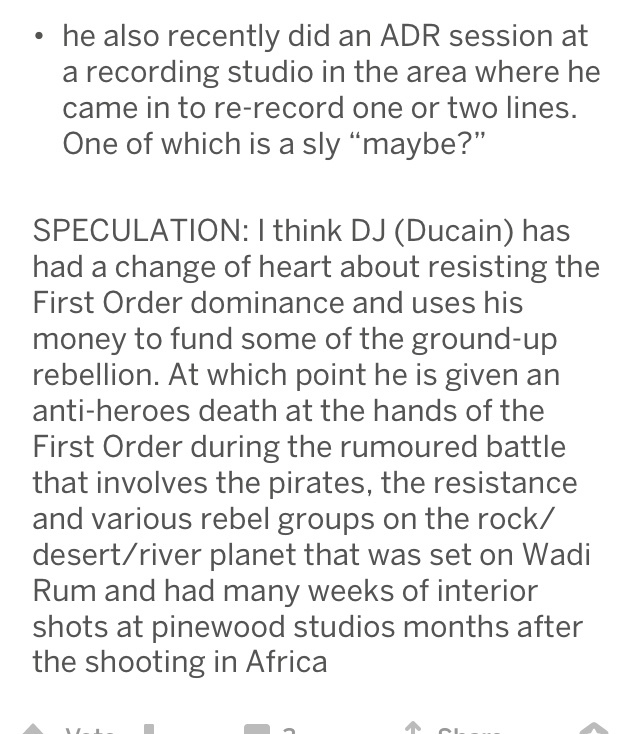 If any of his leaks are true, IX is starting to sound a bit boring to me. 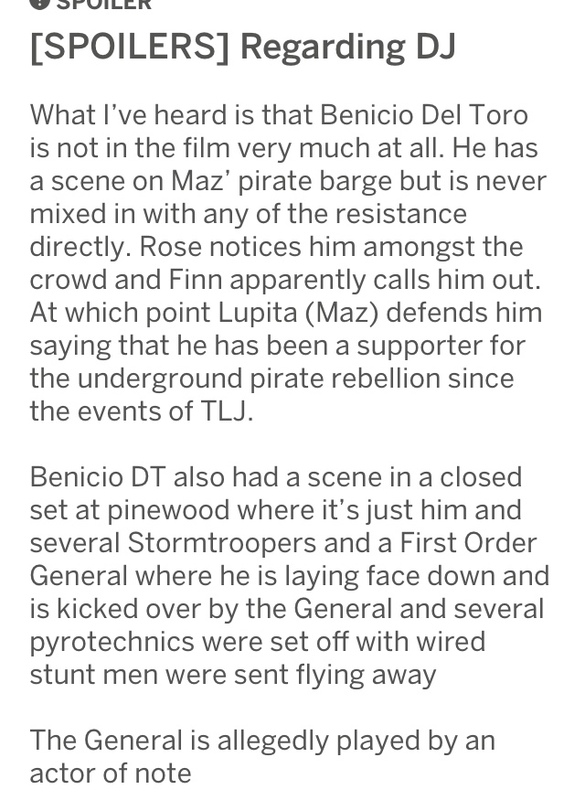 This also tells me if he was an extra, anything with Rey and Kylo is going to be 100% secret until the premiere. They are that desperate they used our reddit incident to make it sound official? I debunked it with the help of another reddit user. It's a pinball game from 2013 with that title. Some leaks are so absurd that I ask myself how these people came up with these ideas. This guy, from the museum, anyway, sounds legit. To tell the true, I'm starting to get worried about how boring these leaks are. Don't you think, guys, this is showing the lack of fans interest in the story? 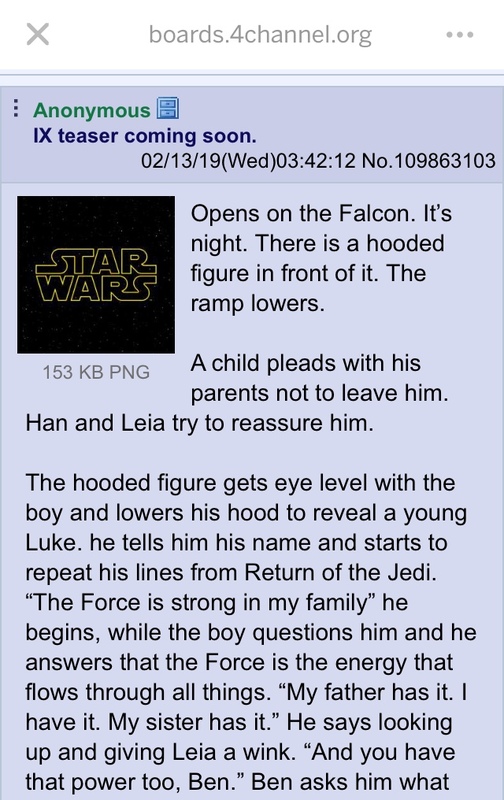 So this is from 4 chan regarding the teaser trailer and title and I know it’s probable faf but I love it and hoping it is real( though doubt it).Also didn’t Jason Ward of MSW say the teaser is a tear jerker well this would make me cry. I was sure that Luke's phrase was addressed to Ben Solo and not to Rey. I already knew it from the first teaser trailer !!!! Hmm... it sounds good on the surface, but doesn't a lot of that info match up with the troll's on reddit? 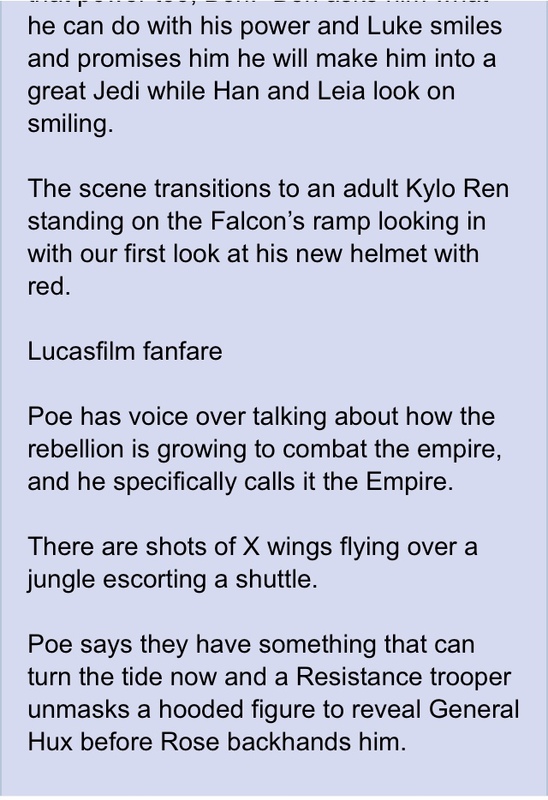 For instance I believe he said that Hux is captured and that there's a scene with Luke meeting a young Ben. That ultimately he was trying to "reveal" that Rey is Luke's daughter, I'm very skeptical about any info that happens to match up with his. 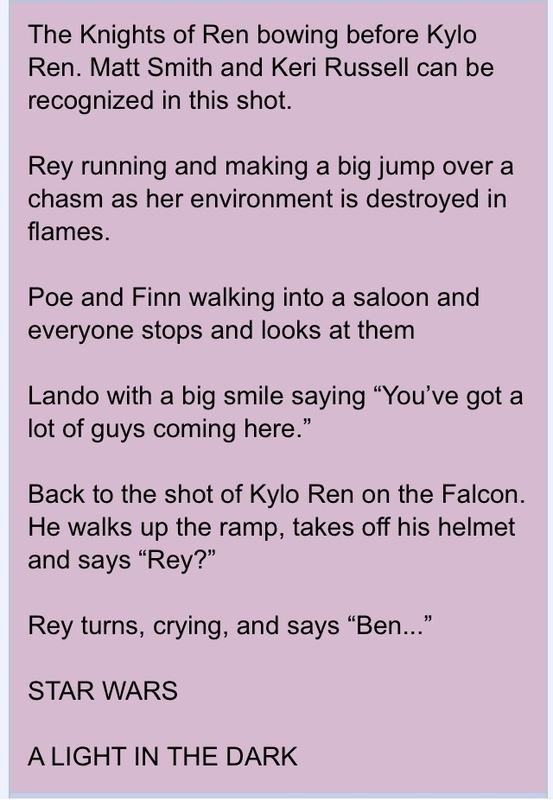 You’ve got a point - I guess I was too focussed on the tear jerker beginning with little Ben coming off the ramp above and the scene at the end with Rey and Ben . One thing that makes me think it is BS unfortunately: I can't see Luke saying to Ben that he will make him "a great Jedi". It's just not something that Luke would say. Besides, wouldn't it be too long for a teaser? I would love that teaser.